The TraveliGo.com Help you find the best prices on flights and airfare purchases of Airlines. Covering both domestic and foreign. Just enter the name of the town or city and airport of departure or destination airport. From a search engine on the Web TraveliGo.com The system will search and display flights at the best of Airlines. Which offers flights on the route your flight. The flights are direct flights more convenient for you. By filtering information such as price, time, and allows you to find flights, according to your needs by quickly TraveliGo.com. You buy a ticket immediately. Quick and easy Without going through the website of the airline or airline ticket sales agent of your choice. Secure online payment system that has an SSL certificate from Geotrust along with promotions for both domestic and international flights. Great deals on flights and discounted more. Routes of Airlines. Both local and international following. -International flights The flight has been popular include Bangkok - Singapore. Bangkok - Hong Kong Bangkok - Japan Bangkok - Macau Bangkok - Malaysia Bangkok - Taiwan Bangkok - Bangkok Australia - China. TraveliGo.com A flight of this airline in all directions. To buy Airlines flights in the best according to your needs. We can use the web to find the best price and buy plane tickets directly. 1.Baggage under the machine, each piece must not weigh more than 32 kg and no larger than 81 cm. X 119 cm. X 119 cm. The airline was established using FD and operations in Thailand. 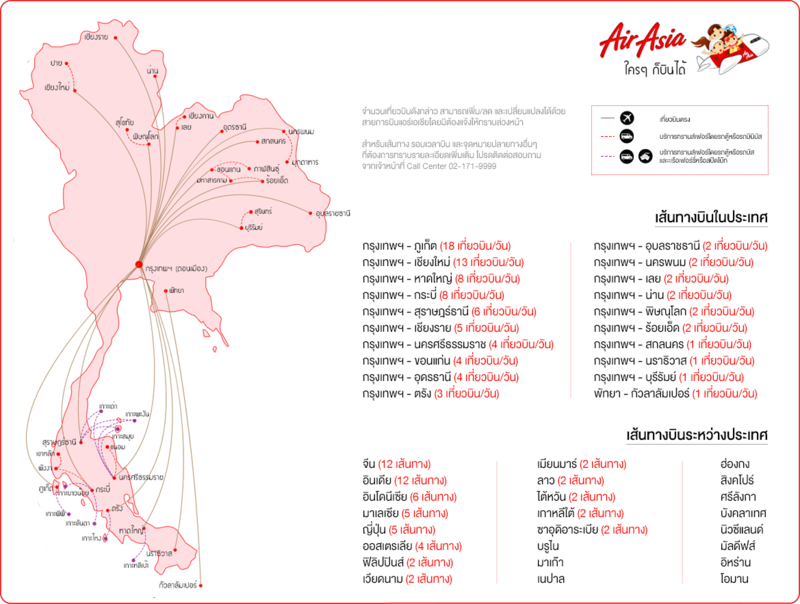 The origins of the expansion of the airline Air Asia flight from Malaysia. The base airport at Don Muang Airport. Is the leading low-cost carrier in Thailand. Highlights of the airline is an airline that is unique. Ready to meet the diverse needs of all service users. Finish transaction and Thai AirAsia e-ticket will be sent to your email.